Belgium international Kevin De Bruyne could return to first-team action with Manchester City when they host Burnley in the Premier League on October 20. Manchester City manager Pep Guardiola has hinted that Kevin de Bruyne could play a part in this weekend's Premier League showdown against Liverpool. Manchester City coach Pep Guardiola has said that attacking midfielder Kevin De Bruyne does not have a £233m release clause in his current deal at the club. Real Madrid goalkeeper Thibaut Courtois has said that he doesn't believe Belgium striker Romelu Lukaku will retire from international football after Euro 2020. Manchester City have confirmed that Kevin De Bruyne could be sidelined for upto three months after picking up a knee ligament injury in training. 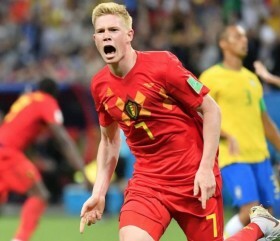 The representative of Kevin De Bruyne has suggested that the midfielder has not suffered a serious knee injury and he could return to first-team action before the turn of the year. Belgium goalkeeper Thibaut Courtois hailed his side's win over Brazil, describing it as 'incredible'. Belgium coach, Roberto Martinez, has hailed former Arsenal striker, Thierry Henry for his role in Lukaku's quality performance at the ongoing FIFA World Cup in Russia. Belgium goalkeeper, Thibaut Courtois has said that he is not looking to lose to the Three Lions of England when the two sides meet in the ongoing FIFA World Cup in Russia on Thursday. Radja Nainggolan is a surprise omission from Belgium's World Cup this summer. Roberto Martinez has named his final 23-man squad and Roma midfielder Nainggolan is a victim of the cull; with Martinez opting for a youthful looking squad.